Happy Valley is an area known for it's abundance of gorgeous luxury homes, high-end new construction and development, great views and fantastic deals. The city was officially incorporated in 1965 and by the late 90's had become one of the fastest growing cities in Oregon. With it's own fantastic city parks, newly built elementary and middle schools, and fantastic location near Sunnyside with excellent shopping and dining, residents of Happy Valley feel right at home. The McDonald Group realtors have sold a lot of homes in Happy Valley, and we think it’s a fantastic place in which to invest right now. Homebuyers can buy an amazing, grand home with a view, a large level lot near great schools in a great neighborhood all within in a few minute's drive to the freeway. We’ve watched Happy Valley’s housing market go through several changes, including short sales and bank owned sales, but what we are seeing as the current and growing trend is new construction homes for sale and they are selling fast. New construction homes are competitively priced, as smart builders are picking up lots at great prices and passing the savings on to the home buyer. Not only does the home buyer get a new home, they get to chose finishes, make changes to the plans or even design their own dream home. When going with a newly constructed home in Happy Valley you can move into the home you envisioned and not spend an abundance of time waiting for the right one to hit the market. Happy Valley is hot right now, and Happy Valley new construction is even hotter. Happy Valley was originally called Christilla Valley, named after the first residents, Christian and Matilda Deardorff. They arrived in 1851 and claimed 640 acres on the floor of the valley. Telephone lines were extended into the valley in 1908 and the first telephone installed. In the fall of 1925 electricity was brought in. After World War II, or about 1946, a central water system was built and homes were then able to have modern bathrooms and kitchens.A fire department was established soon afterwards when Happy Valley received its charter and was constituted a city. Happy Valley is located East of the 205, primarily North of Sunnyside, and just East of Clackamas. Only about 15 minutes from the airport, an 1 1/2 from Mt. Hood and 20 minutes to downtown. It's close to great shopping, has some gorgeous views and is easily accessible. Because Happy Valley is so close to the freeway most all of Portland is an easy trip. Mount Scott, an extinct volcano that is part of the Boring Lava Field, is the highest point in Happy Valley at 1,050 feet. One of the best things about Portland-area real estate is the close proximity of homes for sale in Happy Valley and other Portland suburbs to amazing parks and nature trails. The Portland Metro area features an extensive network of green spaces, state parks, biking and hiking trails, playgrounds, and nature preserves called the Intertwine. Locals and visitors alike have access to some of the most well-kept and plentiful greens paces of any major metropolitan city in America, and those resources are not limited to the City of Portland. Suburbs like Happy Valley feature miles of trails, tons of neighborhood parks, and a general appreciation for the greener things in life. Ashley Meadows Neighborhood Park – 15410 SE Oregon Trail Drive – One of the newly acquired parks to the City of Happy Valley, Ashley Meadows Park is approximately one acre in size with an abundance of activities available. Paved walking paths surround a toddler play area and a jungle gym. Along with the benches, a basketball court and six picnic tables (three of which are covered) this makes for a very family friendly park for all to enjoy. Happy Valley Park – 13770 SE Ridgecrest Rd. – Happy Valley Park features 24 acres of wetlands, and a boardwalk wanders through the wetlands allowing access for all visitors and nature lovers. Happy Valley park also features the Splash Pad, with 16 water sprays in a variety of spray sequences. Moms can sit and watch their children play while enjoying the relaxing sound of the water. The splash pad, which has no standing water and is safe and fun for everyone, is equipped with showers and streams. Happy Valley Park offers an abundance of activities for children, including a toddler park, jungle gym, swings, tire tree, teeter totters, sand box, and a modular play system. Coupled with the picnic areas and horseshoe pits, this makes an excellent combination for a family outing. An off-leash dog area is located in the back southerly end of the park. A fully fenced area has been setup to allow your dog to run free. Dog bags are provided throughout the park, which have been donated by Happy Valley neighborhood businesses. Hoodview Park – Parklane Drive off of SE 162nd Avenue – This sports park is the result of many years of planning and community effort to bring a great recreation resource to the Happy Valley real estate area. Hood View’s artificial turf complex is set to accommodate youth football, soccer, lacrosse and baseball, and youth and adult softball all at one location. Hood View Park has other amenities, including a skate park, a walking path, and a fishing pond! 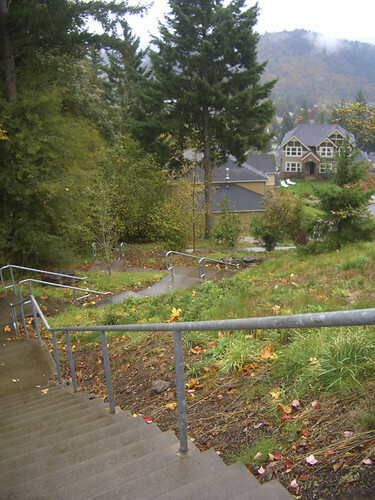 The Stairs of Happy Valley – Starting at the top of the hill in Happy Valley, this 0.6 mile trail of stairs between SE Lenore St and SE Otty Road near SE Valley View Terrace is the perfect place for some morning exercise or a peaceful view of the valley. Southern Lites Neighborhood Park - 12088 SE 117th - Southern Lites Park is a quiet three acre neighborhood park tucked away in the Southern Lites neighborhood. A toddler play area, picnic table, paved walking trails and a basketball court are available for everyone’s enjoyment. Because of the sudden growth of the Happy Valley Real Estate market, homes were being built at amazing speed, and selling. When the market turned many homes were left unfinished and as you can imagine, many remained unsold. The real estate market in Happy Valley today is a market in turmoil for the seller but for the buyer there is great investment and opportunity to be found. A really good price in today's market averages around $108-$115 per sq. ft. for a near new home, of course depending on view, quality and yard size that can vary. Many of the homeowners have had a difficult time competing with the builder discounted prices and are having to "sell short".... One out of 4 homes listed in the Happy Valley Real Estate market is a short sale. There are bank owned homes to be found as well; those transactions tend to be the fastest and smoothest of them all. Most of the homes have been built in the last 8 years, styles are typically contemporary, craftsman, or new construction modeled after some of the older style homes (some of my favorites are modeled after extravagant 4square styles and are located on Tyrne St). Because so many of the homes are built on hills you will find some great views! Happy Valley is still ripe with opportunties to have control over the custom design and building of your dream home by working with a builder. Most builders connected with new construction developments have several different plans they can work from, so you'll need to determine your budget, look at lot options (what area you prefer), walk through a new home the builder has already built so you can sample the quality and finishes and then fine tune the details. There is some poor construction out there so you want to make sure you are working with a reputable builder. The builders we at the McDonald Group work with have lots available to build on in several different neighborhoods, and because they build so many new construction homes in Happy Vally, they have fantastic resources at great prices and several plans to work from. New construction homes are a great way to go! One of the best sushi restaurants in Portland! It seems like there are a hundred restaurants to pick from down Clackamas' 82nd Avenue strip, however, it's hard to find one that's not a chain and most importantly, serves edible food. For this reason, Bluefin Sushi will be a go to spot! If you can't find what you're looking for in Happy Valley you are sure to find it just a few miles west into Clackamas where you can start your shopping adventure at Clackamas Town Center.